The findings are based on months of undercover field research made public by the Environmental Investigation Agency (EIA). Approximately 300,000 cubic meters of logs have been smuggled from Cambodia and legalized in Vietnam through these quotas since last November, with kickbacks as high as $13 million. The related report from the EIA comes on the eve of Vietnam’s bid for a FLEGT agreement on timber with the EU. HO CHI MINH CITY, Vietnam – A new in-depth report from the Environmental Investigation Agency (EIA) shows that Vietnamese officials, companies and private individuals are smuggling enormous amounts of illegally logged timber from protected areas of Cambodia into Vietnam. The report, “Repeat Offender: Vietnam’s persistent trade in illegal timber” provides eye-opening details gleaned from months of undercover investigations in Cambodia and Vietnam by EIA investigators. EIA alleges that Vietnamese government officials are reaping huge financial benefits by facilitating large-scale logging in eastern Cambodia. Jago Wadley, senior forests campaigner at EIA, described the situation in the starkest of terms. Vietnamese representatives will meet in Brussels this month to finalize a Forest Law Enforcement, Governance and Trade (FLEGT) agreement with the EU. On paper the agreement would ensure that all timber exported to the EU from Vietnam has legal, verifiable origins. However, the EIA found in their investigation, which they conducted from November 2016 to March 2017, that Vietnamese government officials and security force personnel are major customers for illegally logged Cambodian timber. They are banking millions of dollars in illegal cash bribes, kickbacks, and fees from timber smugglers while hundreds of thousands of cubic meters of logs are pilfered from Cambodian national parks. During the investigation period, unprecedented illegal logging was uncovered in Cambodia’s Virachey and Ou Ya Dev national parks, as well as Lumphat Wildlife Sanctuary. These areas are located in Cambodia’s Ratanakiri province. All of the logs were being moved into Vietnam. The timber smuggling from Cambodia to Vietnam is taking place despite a blanket ban the Cambodian government placed on log exports to Vietnam early last year. Corrupt officials on both sides of the border have rendered this ban toothless. 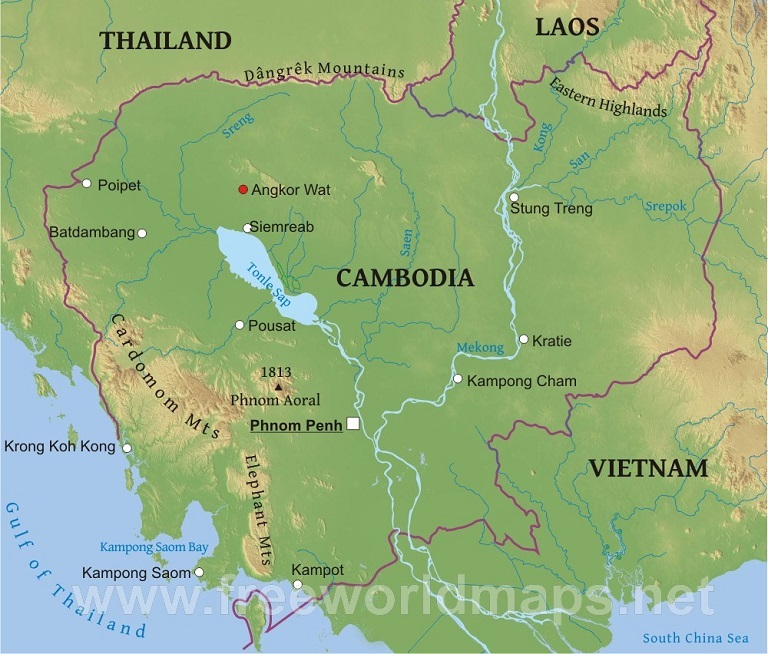 The EIA found that Cambodian officials are taking payments from neighboring traders, while Vietnamese authorities have created quotas to give the logs legal status within the country while incentivizing devastating logging. It is estimated that roughly 300,000 cubic meters of logs have been smuggled from Cambodia and legalized in Vietnam through these quotas since last November, with kickbacks possibly reaching over $13 million. While these profits go to local officials directly involved with the illicit trade, the central government has also benefited by taxing these imports, effectively sanctioning illegal activity, the report alleges. The massive theft of Cambodia’s forests has largely been directed from Gia Lai province in Vietnam’s rugged Central Highlands. In late 2016, the provincial People’s Committee permitted the importation of 300,000 cubic meters of logs through five designated border crossings, in addition to divvying the amount up among 16 local companies. According to this regulation, the entire amount of logs must be brought across the border before May 30. First-hand observations by EIA reported seven major storage depots on the Vietnamese side of the border where logs were brought after exiting Cambodia. These depots appeared in late 2016, along with roads leading to the logging sites. After clearing customs, the logs were taken to factories in Gia Lai and Ho Chi Minh City, Vietnam’s commercial capital, as well as to buyers in Quy Nhon, a port on the south-central coast. Meanwhile, Vietnam is also removing large amounts of Siamese rosewood from Laos, despite a largely effective ban put in place by the Laotian government. During a visit to Đồng Kỳ , a wood processing village outside of Hanoi, EIA investigators were offered 1,000 tons of such timber per month. 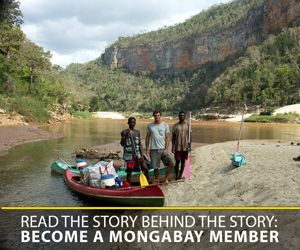 Reporting by Mongabay in the same town late last year revealed lax enforcement conditions. 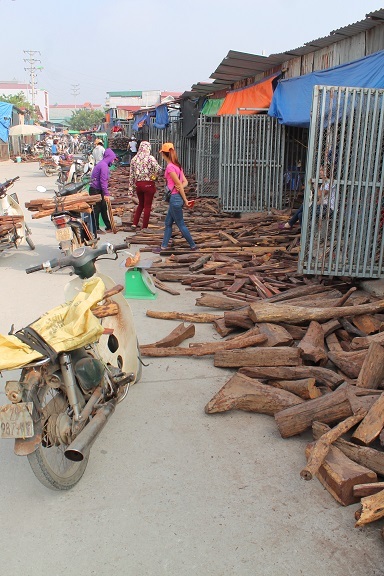 A large timber market with little oversight is located in the center of Đồng Kỳ , where traders shared that their supply came from Cambodia and Laos, even though both countries have banned exports to Vietnam. Such blatant illicit timber trading should give the EU pause before signing its agreement with Vietnam, EIA argues. It will be difficult for the European bloc to verify timber imports when corruption is so rampant along Vietnam’s border. This isn’t a small industry either, as Vietnam’s wood product exports are now the sixth-largest in the world, estimated to hit $8 billion this year, up from $7.3 billion in 2016, according to the report. “Vietnamese State involvement in multi-million-dollar transnational organized timber crime simply cannot be accepted by the international community and absolutely must not be ignored by the EU,” states Wadley. Banner image: Arevs in O’Tabok, Virachey National Park, Cambodia Feb 2017. Photo courtesy of EIA. Michael Tatarski is a freelance journalist based in Ho Chi Minh City, Vietnam. You can find him on Twitter at @miketatarski.